Published: May 2, 2015 at 06:44 p.m. 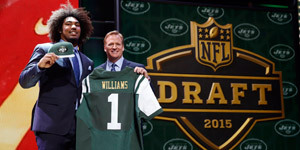 Updated: May 11, 2015 at 03:00 p.m.
CHICAGO -- There were 256 players selected in the 2015 NFL Draft who now have a place to call home. But for those who didn't hear their name called over the three days, it doesn't mean hope of making an NFL roster is lost. They are now free to sign with any team that wants them. Here is my position-by-position list of the best priority free agents available following the 2015 draft. We'll keep it updated as they sign with teams.